The worst thing about the Olympics is how temporary they are. It's like a sleepaway-camp friendship: We just spent a compressed amount of time with the Olympic athletes, getting to know them. We found out who was genuinely nice (Simone Biles, we love you!) and who is kind of a jerk (ahem, Ryan Lochte). We learned where everyone was from, gleaned their backstories, heard about their competition histories. And then, when our appointed time was over, we waved goodbye with only half-hearted promises to keep in touch until the next time we all got together again. Say it's not so! There are other chances to see our favorite Olympians in-between games, though. So, which Olympic athletes are going to the 2016 VMAs? You might not think that MTV's Video Music Awards are the natural place to spot the Olympians on their first round of TV shows after the games — you'd probably think they'd find their own reality shows, or show up someplace that relies on athletic ability, like Dancing with the Stars. But if you're a fan of both sports and music, keep up hope: A few of the athletes are definitely stopping by. Others, well, not so much. Here are the chances of seeing some Olympians at the awards show. According to a press release from MTV, Phelps has signed on as a presenter. Phelps has presented at the VMAs before, in 2008, so he has some experience. He also just finished hosting an episode of America's Got Talent , so maybe TV journalism could be his post-swimming gig. 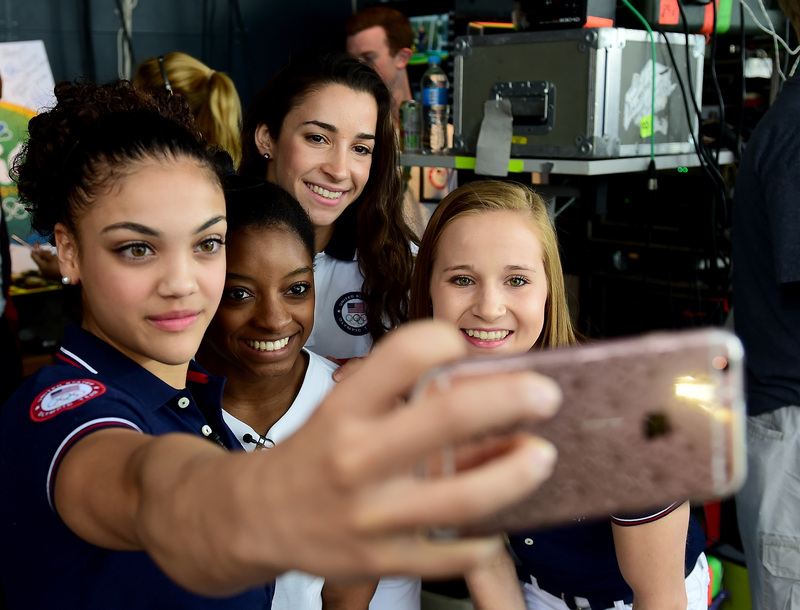 The all-powerful women's gymnastics team—aka Simone Biles, Aly Raisman, Gabby Douglas, Madison Kocian, and Laurie Hernandez — are also confirmed by MTV as presenters. I hope Zac Efron's also there so that Simon Biles can get another hug from him. ...But What of McKayla Maroney? Maroney wasn't a part of the "Final Five," but she did compete with the U.S. gymnastics team in London in 2012. Now, according to MTV, she wants to make her own Taylor Swift-inspired pop music. Given that some of her teammates will be in attendance, she's been to the VMAs before, and she's into music now, she could make a surprise cameo. The rumor from Us Weekly is that the swimmer is saving his post-apology TV stent for Dancing with the Stars. But can he move as well on dry land? Ledecky has been making post-Rio appearances, such as throwing out the first pitch at a Nationals game, but there's been no whispers about a VMA appearance. She's probably gearing up to be a student at Stanford University, where she'll be attending for the 2016 school year (on a swimming scholarship, naturally). The swimmer has kept a low profile since Rio. Hello, Simone? Are you out there? They swept the the women’s 100m hurdles, but can they dash down the red carpet? It would be cute if they could re-create their famous jumping photo, but it doesn't seem to be in the cards—there aren't even rumors of their attendance. Okay, she's not an athlete. And, sure, there's nothing indicating that she's even thinking about going to the VMAs. But, personally, after Rio, I want to see Jones attending everything, everywhere. Let's make it happen, MTV.